We are just over 2 months into our weaning journey with Baby S and even now we are still find new, exciting recipes and foods to try every week! Weaning can be a daunting time for the whole family with so many foods to try, that's before we even mention textures, lumps and finger foods. 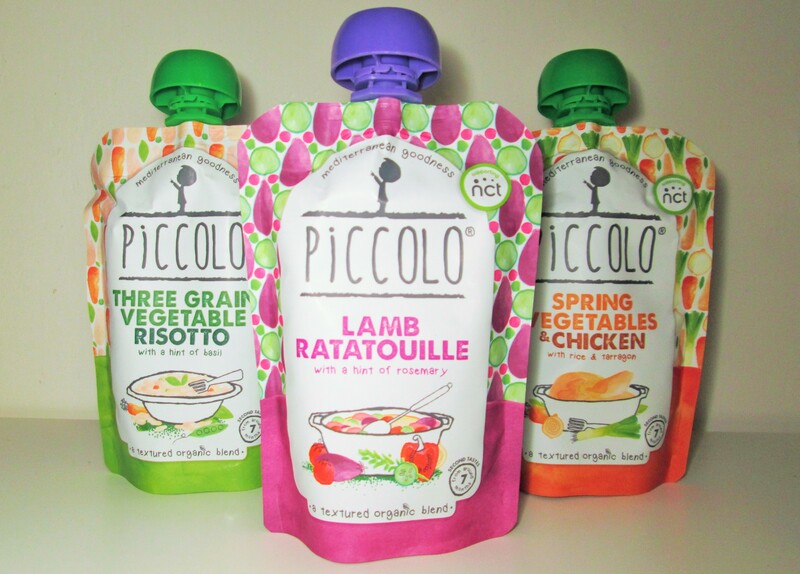 So when Piccolo got in contact about trying their range we got pretty excited to try their range with Baby S.
Piccolo is an organic range of baby food with Mediterranean roots. It's founder Cat was brought up on good, wholesome Mediterranean food her whole life and now it is the roots for her own family. She set out to provide guidance to parents in the disadvantaged areas of London about baby nutrition and healthy eating with The Food Education Foundation. Cat found inspiration in the work of the foundation and that was how Piccolo was born. A way to give busy parents the means of giving their babies the best start in life and in their food journey. Each pouch of Piccolo is made using organic ingredients and is full of exciting flavours. Even now Piccolo give 10% of their profits to food education charities, helping other parents to be more food aware for their children. Piccolo have Two different ranges of foods with a stage 1 and a stage 2. Stage 1 include three different ranges but is made for the start of your weaning journey with its Pure pouches which are suitable from 6 months. We tried the Piccolo Pure Williams Pear pouches which Baby S enjoyed on the go. I think these are a great place to start when weaning but also to keep in the cupboard or changing bag as a quick on the go snack or to pair up with other food items. Pear puree can be a great dip for bread sticks! Baby S loves to try some new flavour pairings with bread sticks, fruit/ veggie sticks and other little snacks the Piccolo Pure range is perfect for doing that when you're in a rush or running late. With mango, banana and Stanley plum being the other pure tastes in the range there is a good bit of choice. I was surprised how strong the taste was but Baby S seemed very interested and the Banana is on my shopping list to grab for dipping gingerbread, pancakes, rice cakes and other exciting snacks and treats into. Stage 1 also includes the next step in weaning, pairing foods. I really struggle with which foods you should try pairing up for babies. I probably over think it all but finding good matches can be hard once you stray past the 'norm'. Piccolo have their Vegetable Patch selection as well as a large selection of combination pouches. I love that Piccolo create some usual and some very different combinations. In the Stage 2 selection there are some yogurt and porridge combinations too. These are perfect for breakfasts and since they are in pouches you can pop them in your bag if your off out and baby has decided it's the perfect day for a lie in. Baby S always picks the one day I need to head out early for a lie in so I have really found these handy to have in the cupboard. Baby S enjoyed the Parsnip, Carrot and Leek combination from the Piccolo Vegetable patch range but she got really excited about the Sweet Potato, Beetroot, Apple and Pear which is a combo I would never have made myself! I like this range in particular as it is suitable for babies to enjoy from 6 months and there isn't really any limit! We loved pairing up the stage one combination pouches with pasta, couscous and rice for quick and easy lunches with pieces and textures in. Baby S does prefer to have some texture added over just puree. She always wolfed down those lunches. A particular favourite has proven to be the Piccolo Sweet Potato, Beetroot, Apple and Pear when paired up with pasta, peas, broccoli and chicken. I use the Piccolo pouch like a sauce mixed in and she loves it! Baby S was moving on to textured foods when our Piccolo pouches arrived and we had been sticking to very typical tastes and meals. All that was about to change however! Piccolo have an amazing range of tastes and combinations that even had my mouth-watering. I knew Baby S would find the range exciting and very interesting with new colours to explore as well as the textures and tastes. Baby S seemed to really enjoy both the bigger size and portion of the stage 2 pouch as well as the new tastes they had in store. We tried all the pouches but the clear winner was the Spring Vegetables and Chicken. As you can see she always got so excited about that one! It was clear she knew what was inside the pouch. As the last few weeks have went on it has become more apparent that Baby S much prefers her food to be very thick and to have bits in which I do think could be a new range for Piccolo past the textured stage. I like that the pouches in stage two come textured rather than with chunks or bits in as I do remember that D hated the chunks in stage 2 foods when he was weaning and it is much easier to add chunks than to remove them. I really love that when I turn the Piccolo pouches over and read the ingredients there is not one that I feel the need to question! I know each and every food item that has been added to each pouch and more importantly I know why it is there! I have no doubts and no worries when I open a pouch and give it to Baby S. There is nothing inside apart from good wholesome and well-balanced food made especially for babies and parents. What's not to love about that? We have really enjoyed the whole Piccolo range, the handy pouches are just perfect for popping into the changing bag when your off out and they mean you aren't carrying around a bowl too. I would recommend trying Piccolo on your weaning journey no matter what stage you are currently at. The Pouches from all the stages of the Piccolo range can easily be adapted, added to or used just as a delicious dip for quick snack at all ages! Piccolo is the answer for busy parents who really want to give their babies and toddlers a new experience of tastes and combinations that are truly unique to the piccolo range and very exciting. Piccolo Organic Baby Food is available in Boots, Asda, Waitrose, Morissions and Mothercare to name a few. * The range starts at just 90p. *For the full list of stockists check the Piccolo website. Disclaimer: We received the products featured in this post in exchange for an open and honest review. All the thoughts and opinions which have been expressed are my own.